One of the best parts of blogging is when I get to help out others in some way. 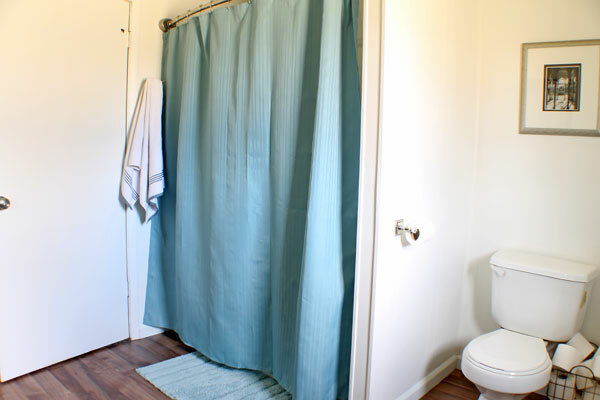 Recently I was contacted by Virtu USA to make over a bathroom, and since I’m happy with both of ours, I decided to use the opportunity to give my mom & dad a bathroom makeover instead. My dad has been battling cancer for a couple of years now, so it was really nice to be able to give their bathroom a much needed update. 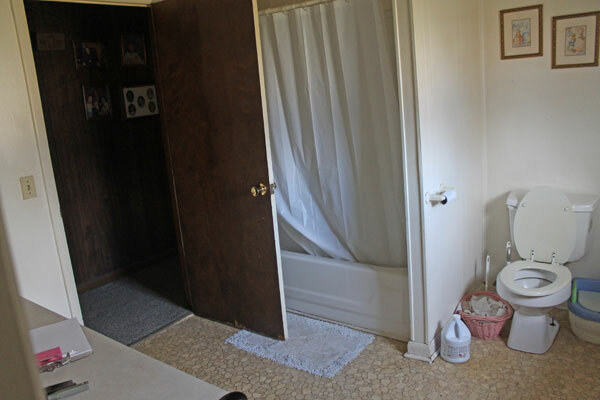 Before we started, her builder grade bathroom from the early 1990’s didn’t have enough storage, the flooring was wrinkled, and it just needed an update. Not everything needed to be replaced, the tub and toilet were perfectly fine, so we set out to make some big impact with some small changes. We started by putting in a drop tile ceiling to cover up some wonky popcorn ceiling action and took out the wrinkled linoleum and put down click together laminate flooring. 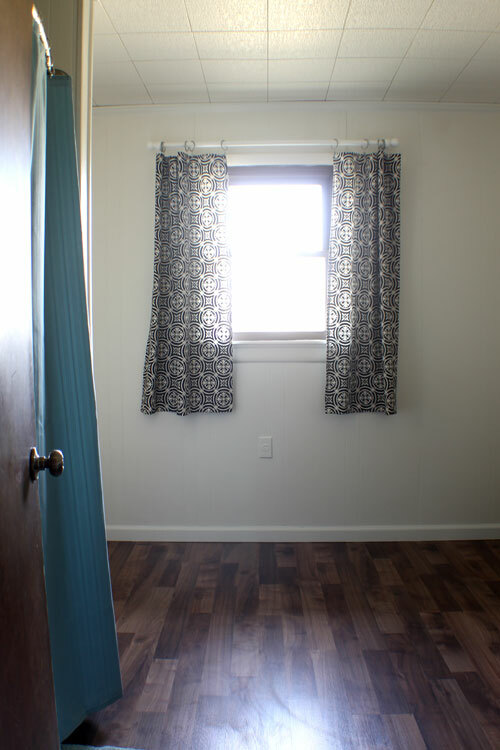 The walls got a fresh coat of Sherwin Williams Pure White, and I even whipped up a quick set of curtains from some scrap fabric. See, this part just got a little decorative love with the help of some new accessories. 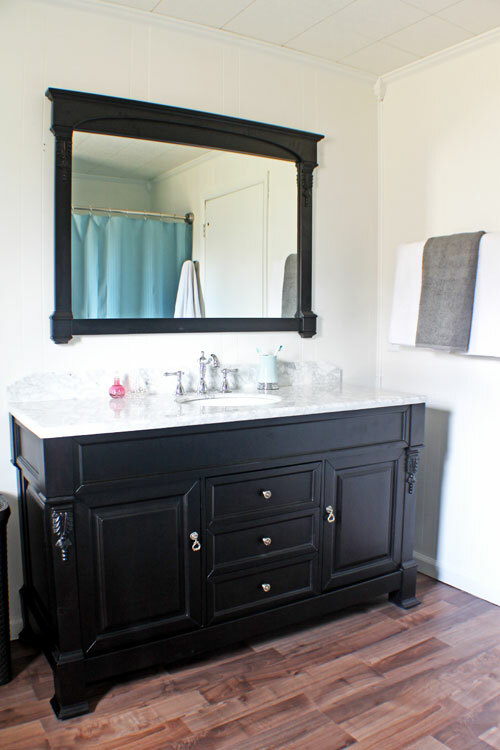 The other major change came in this new vanity from Virtu USA. Look at the details, the marble top – my mom was so, so excited to have such a stunning vanity in her new bathroom. They also sent this new faucet, which is simply stunning. The craftsmanship of all of the component was breathtaking. 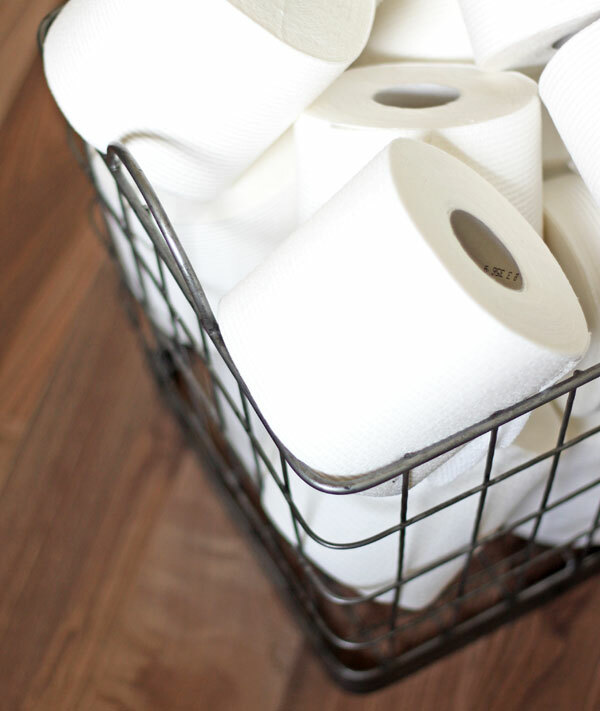 Want a bathroom makeover of your own? 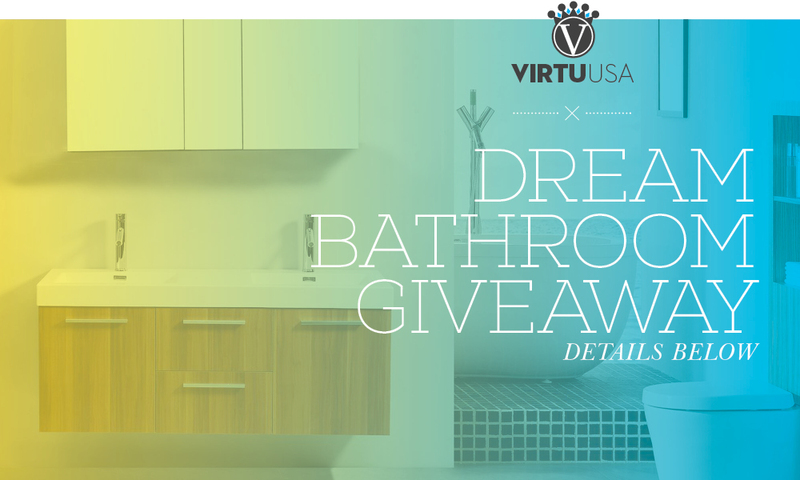 Virtu USA is giving away TWO bathroom makeovers and several smaller prizes. Be sure to jump over to their website to get the info to enter! 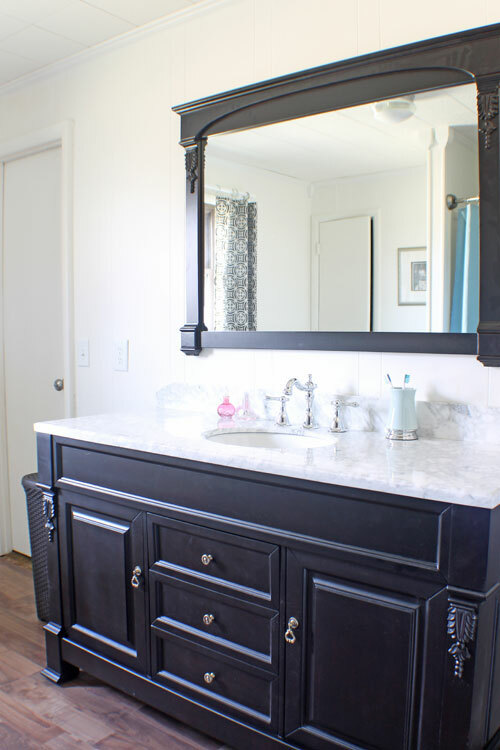 What a gorgeous vanity – and how special that you were able to do this for your parents – must have felt better than even doing it for your own home, right? Wow, what a change. I love the Vanity! Good on you for helping your parents out with a makeover, blessings for you family for all they are going through! 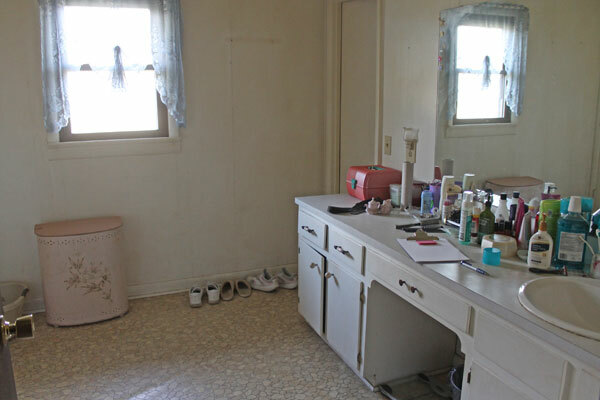 I love the makeover, but really love the vanity and faucet. Beautiful addition to your parents bathroom. Great job! Love the change to the bathroom. You did an amazing job. Seriously gorgeous, Gina! Love the carved details to that vanity! What a difference, they must adore their new bathroom! love it. I’m drooling over that vanity. it’s funny how parents and grandparents live w/outdated rooms, but LOVE it when it’s redone. I wonder why they don’t think to update it for themselves? they deserve it after working for years and they would enjoy the updates in their retirement. I understand finances are an issue for most folks so dont misunderstand. Great makeover – I’m so glad you could do this for your folks. Lovely makeover. 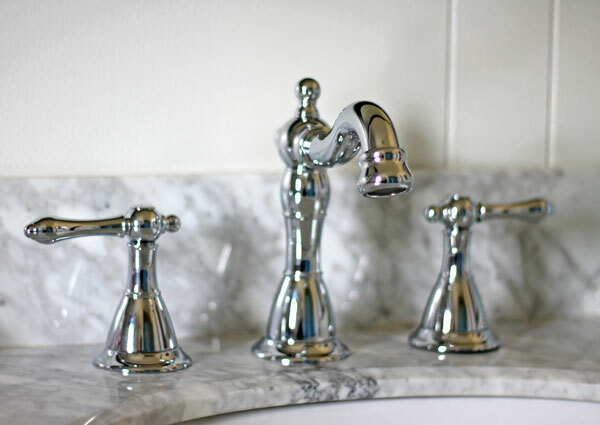 I have never heard of Virtu before – but I will definitely be checking them because I am changing out some sink fixtures and I absolutely love the faucet set you used. Why do I have a feeling mom and dad are spending wayyyyy more time in the bathroom these days! The whole redo is wonderful but that vanity makes the space. You dun good. What an awesome gift to give your parents!!! I know they have to just love their beautiful “new” bathroom! Great job! I absolutely love the vanity/mirror set. I just love this! We’re getting ready to remodel our master bath (it still has carpet. Gross!) and I need all the ideas I can get. What a wonderful gift you gave your parents. It’s amazing how a few simple changes can make a room look new. The bathroom now looks beautiful. Great job!!! Stunning detail on the vanity cabinet, and pretty detail around the mirror. LOVE the faucet a well. Your curtains complimented everything just beautifully. You have such good taste! What a great transformation! I am sure your mother will be very happy with the increased value in her home as well!! Nice work! I have a 46.5 space between 2 walls to fit a new vanity. what size should I buy. 40″ would leave approx. 3.” per space. Oh Gina, you did a fabulous job with this very generous gift from Virtu! So wonderful that you chose to gift it to your Mom. So sorry about your Dads health issues. Hope they enjoy their new bathroom. I just love your work! Thank you so much Deborah, you are so sweet!